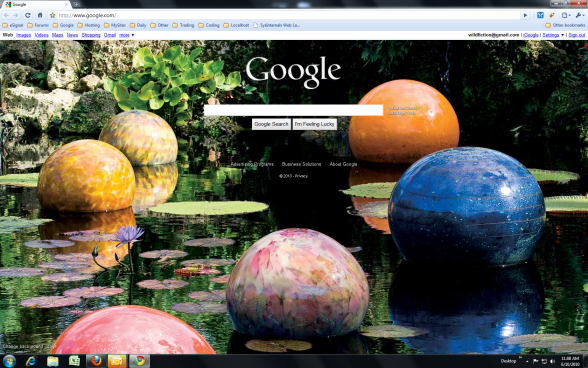 I noticed this morning that Google has take a leaf from the Bing book and added images as a background to their home page. I think this is great as the images are always fascinating and high quality. However, the one thing that irks me with both Google and Bing home page images is that there doesn't appear to be an easy way to find out where the picture was taken. I would love to know where this was taken, but it may always be a mystery to me unless someone posts a comment here letting me know the source. The title tag says "Niijima Floats - Artist, Dale Chihuly." and shows up when you hover over the image in Firefox. Apparently his website is http://www.chihuly.com/ and looks like he does some really cool work. I've tried it in Firefox but can't get that tag to show up when I'm hovering over it. No idea what I'm doing wrong.